Ah, the birds came first theory of amphibian descent. @MikeTaylor Nice photo! 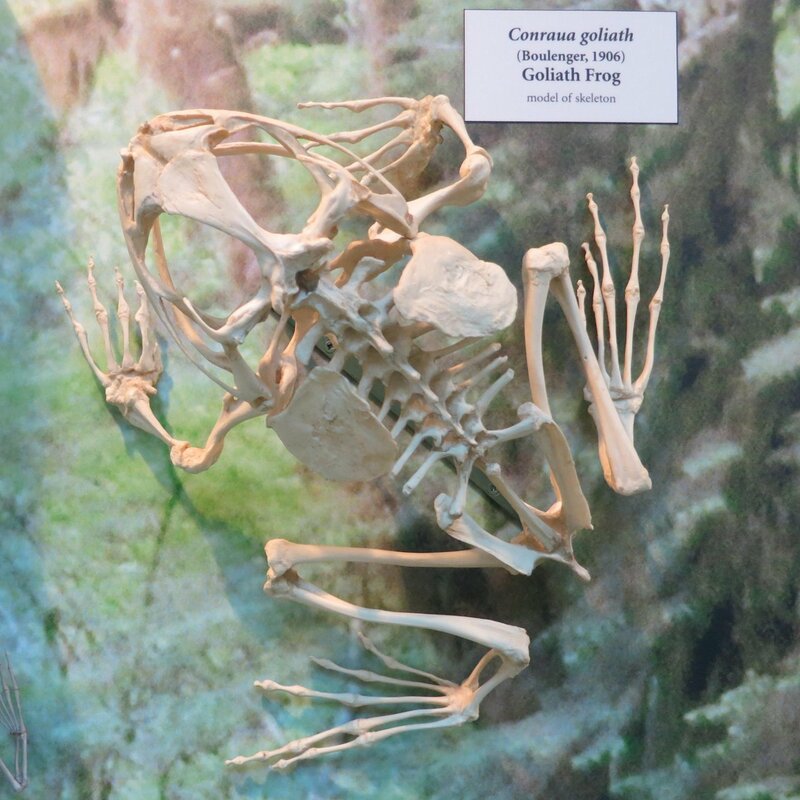 …but technically the Goliath frog #Conraua isn’t actually hyperossified, just very large. Yeah, “hyperossified” would mean a sculptured skull surface and stuff. Beelzebufo was called a “hyperossified megafrog” in the SVP abstract that announced it in… 2007, I think. Is that the tip of the stapes in the caudodorsolateral corner of the skull? Perhaps the angle of the old photo obscured the perforation in the humerus. In the new photo (click to enlarge), it is clearly visible. 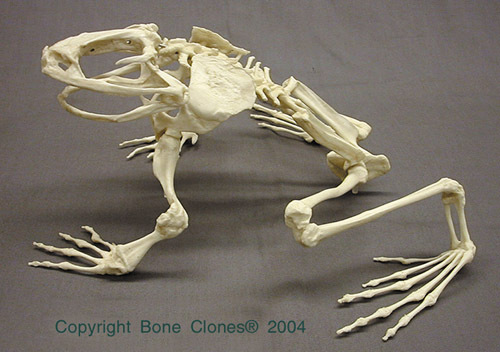 Hyperossified frogs have usually thick bones and sculptured, fused skulls. A large frog isn’t essentially hyperossified, and not all hyperossified species are very large. I have a great fascination with these species, as they could give us a glimpse back to paleozoic forms. Hyperossification starts quite early in their development, and it is considered a peramorphic feature. This, together with other weird features like non-pedicellate teeth and reapearance of bones that do not have the time to ossify in most species might suggest atavisms to paleozoic amphibians. 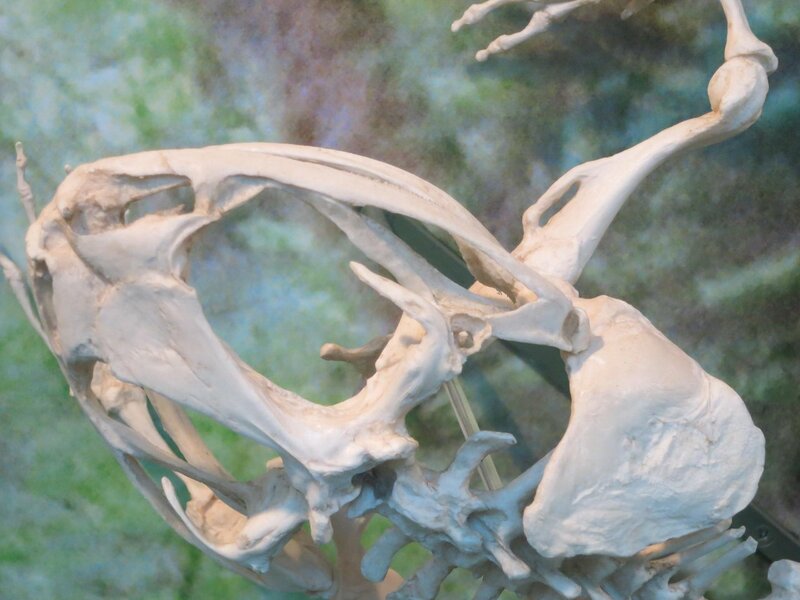 Most hyperossified species are either fierce carnivores or burrowers, and in the first case at least they resemble hyperossified temnospondyls. Why most modern amphibians, even strongly terrestrial ones, are flimsy, cheep to make versions of their ancestors is a mystery to me. Why they lose their strong bones for a nearly cartilaginous frame like they evolved to be eaten or smashed? Many have toxins to protect them, but not all, and we are not sure if the older, hyperossified forms had toxins as well. Very rarely you will find species with real skulls or bony plates. The same happened to fish, of which most teleosts have just nominal scales and spine-like bones. Why? Was the availability of calcium greater back then? Or they got under competition from other vertebrate lineages? I have also a pet Cranwell’s horned frog, Ceratophrys cranwelli, which is a little hyperossified monster that can attack everything. It is indeed very different from other, more typical frogs both in its lifestyle and in its mode of eating. It also has osteoderms overlaying its vertebrae for extra protection, Cacops also had those, and also had a similar body shape. The topic becomes even more interesting if it is true that cacopids are most closely related to lissamphibians. Could both have a similar ecology? Could these osteoderms be atavisms, or just neomorphs? From what I know, no such study has been undertaken. I also plan to get a Pyxicephalus adspersus to compare the two. Pyxicephalus has not the osteoderms though. It is just a fortified ranid. But really fortified. You’re right, Bolko, I mistitled this post — as Marc Evans pointed out in the tweet I quoted above. In fact I titled it after a poster he’d presented at one of my first SVPCAs, and which tickled my fancy. Is there any relevant study to answer my questions above? Could you point me to the right direction? Bolko – I think you hit the nail on the head when you said they were “cheap to make”. Modern amphibians have largely gone down the path of high-r-selection – grow fast, mature early, breed profligately. This is why they’re small (Conraua and even Andrias are puny by Paleozoic standards) and lightly built. Building a massive skeleton is a big investment that takes resources away from growth and reproduction. Besides, what good would it do? Most of the predators that frogs face outsize them by an order of magnitude or more; a heavy skeleton would not deter a snake, perciform, or heron that could swallow the frog whole, or the powerful jaws of turtles, crocs, or carnivorans. Mike – I seldom comment but I’m a regular reader. You guys are awesome. Keep up the good work! Thanks, Nathan, we really appreciate comments like yours!